Awakino lies beside the beautiful Awakino River, on one of the last bends before the river drains into the Tasman Sea. Whitebaiting stations and small jetties are located on both sides of the river. 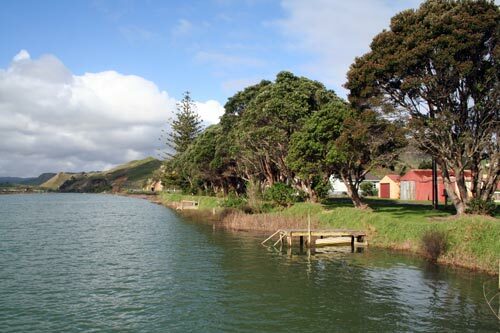 This is the settlement of Awakino, looking up the river along Iredale Quay. Awakino is where my step mum's family grew up in the summer holidays - swimming, kayaking, eating smoked kawai, and going hunting. I enjoyed going there with her.